Since Halloween is close upon us, here is a reprint of a 2012 post about Halloween and related matters (ch. 38 in my book, No Place for Normal: New York). It’s spook time, and I don't mean the election. A candy store near my building features witches in orange and black in its window, and a pharmacy offers a host of eerie items: skulls, bones, skeletons, a severed arm (fake, of course; there are limits), a bat, huge spiders and their webs, a black cat, and a vulture that looks hungry. (Not the best display for an outfit dispensing medicines meant to help and heal, but they like to be seasonal.) So Halloween must be in the offing. But I won't confine myself to the holiday. This post's subject and the next will be our ambiguous attitude toward death and the dead, a vast subject that, given the many associations and scraps of history dancing in my head, will probably spill out in all directions. But we'll start with Halloween. For most of us, Halloween means ghosts and witches and skeletons, trick-or-treating, costumes, jack-o’-lanterns, and innocent or not-so-innocent pranks – a completely secular event. But the name “Halloween” is a contraction of All Hallows’ Eve, referring to the Christian feast of All Hallows on November 1, and Halloween, celebrated on October 31, has both pagan and Christian antecedents. It has been traced all the way back to the late-autumn Celtic festival of Samhain, when the physical and supernatural worlds were closest; the souls of the dead were thought to revisit their homes, and bonfires were built to ward their spirits off. The Christian holy day of All Saints’ Day, November 1, was a time for honoring the saints and praying for the dead, who until this day were thought to still wander the earth prior to reaching heaven or the alternative. But this was also the last chance for the dead to wreak vengeance on their enemies before entering the next world, so to avoid being recognized by them (hmm… they must have felt guilty about something), people disguised themselves by wearing masks and costumes: the beginning of Halloween costumes. So are the dead to be welcomed and prayed for, or dreaded and avoided? Both, it seems. Which shows, I think, a profound ambivalence. As for jack-o’lanterns, they developed out of the custom in Scotland and Ireland of carving turnips into lanterns to ward off evil spirits. Coming to this country, immigrants from those countries used the native pumpkin instead, whose size and softness made it much easier to carve. The name itself probably comes from an Irish folktale about a man named Stingy Jack who outwitted the Devil but after his death, being barred from both heaven and hell, was doomed to wandering the earth with an ember to light his way. Children’s trick-or-treating came later, being first recorded in North America in a Canadian newspaper of 1911. Wikipedia dates the first use of the term in the U.S. from 1934, but I can testify that by then all the kids in my middle-class Chicago suburb were ringing neighbors’ doorbells in hopes of goodies, though usually not in costume, without any thought of pioneering a new Halloween custom; as far as we were concerned, this is how it had always been, though we were much more into treats than tricks. (Still, my father, fearing vandalism, always wired the gates to our backyard shut, to keep out devilish intruders of whatever species or persuasion.) By then, too, the costumes that some people donned were not confined to the eerie stuff (ghosts, skeletons, witches, and such), but included just about anyone or anything you could think of. All of which shows how a holiday once concerned with praying for departed souls and warding off evil spirits has become, in the U.S. today, a children’s fun fest spiced with just a touch of the eerie. South of the border things are just a bit different. Related to Halloween in Mexico is the Day of the Dead (el Dia de los Muertos), celebrated on November 1, a national holiday when people gather to remember and pray for deceased friends and family. Altars are built in homes and cemeteries, and offerings are made of sugar and chocolate skulls, and bread often in the shape of a skull and decorated with white frosting to resemble twisted bones. Photos and memorabilia are also placed there, in hopes of encouraging visits by the dead, so they can hear the prayers and comments of the living. Associated with the Day of the Dead is the la Catrina,the Grande Dame of Death, a skeleton presented as an elegant woman with a fancy hat. This beloved figure of Mexican folk art first appeared in 1910 as an etching by the printmaker José Guadalupe Posada, but can be linked to Mictecacihuatl, the Aztec goddess of the dead. She satirizes high society, but also shows how Mexicans bring death close to them and celebrate the joy of life in the very face of its opposite. During my two trips to Mexico long ago I never encountered her (wrong season), but photos of her are unforgettable, reminding us how tame our Halloween images are in comparison. And in the National Museum of Anthropology in Mexico City I saw many Aztec sculptures of gods adorned with human bones and skulls. (They were a cheery bunch, those human-sacrificing Aztecs.) Obviously, we mortals have many ways of facing – and facing down – death. All right, Mexico and la Catrina are pretty far removed from New York, the alleged subject of my blog, but I warned you that I might stray far and wide. So to get back to the Apple, how about the doctors’ riot of 1788? No, the doctors didn’t riot; in fact, they came close to being lynched. bodies from graveyards. During the Revolution, battlefields provided a good supply of unclaimed bodies, but with the coming of peace the need for more bodies intensified. In New York the students at the city’s only medical school, Columbia College, raided the Negroes Burial Ground, where both slaves and freedmen were buried, but also the graves of paupers in Potters’ Field, while usually – but not always – respecting the graves of those “most entitled to respect.” So great was the demand for bodies that a new occupation appeared, the professional body snatcher, or resurrectionist, whom the medical schools could hire. Aware of the risks, grieving families often hired guards to watch over the grave of a loved one at night for two weeks following burial, since after that the bodies would be too decomposed for purposes of dissection. 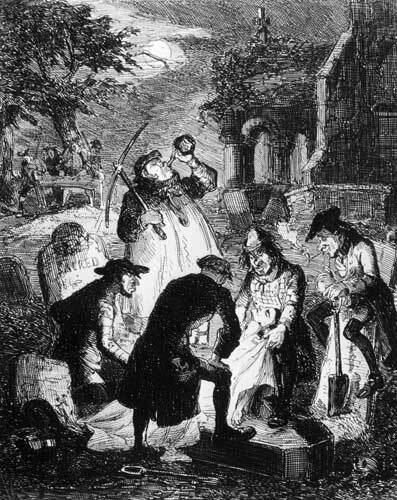 The authorities were certainly aware of the activities of body snatchers, whether professional or amateur, but probably chose to look the other way, as long as it was all done discreetly and confined to the graves of the lowly, but by the late 1780s trouble was brewing. Then, in April 1788, the storm broke. Accounts differ, but it seems that a group of boys playing outside the dissection room of City Hospital saw a severed human arm hung up to dry in a window, and rushed off to tell their elders. An angry mob quickly gathered and surrounded the hospital, then broke in and, finding three fresh bodies there, one boiling in a kettle, destroyed everything in sight, including valuable specimens collected over many years, as well as surgical instruments. Most of the doctors and students had escaped, but one doctor remained with three medical students, and only the sheriff’s removing them to the city jail for their own protection saved them from being lynched. The mobs’ anger did not subside overnight, and many doctors found it convenient to take a sudden vacation out of town. The governor called out the militia, but the mob disarmed some of them and attacked Columbia College, destroying more medical specimens and instruments. Alexander Hamilton tried in vain to calm them, and John Jay (a future Chief Justice of the Supreme Court) was hit by a rock and knocked unconscious. That evening the mob threatened the jail, where the doctor and students were still lodged. When the rioters hurled bricks and rocks at the militia, the soldiers finally opened fire, killing eight and wounding many more. Those doctors still in town treated the wounded, and the rioters dispersed the next morning, thus ending the new nation’s first recorded riot. Some weeks later the New York legislature passed a law permitting the dissection of hanged criminals. Unfortunately, there were never enough of them, so resurrectionists and their opponents would persist well into the next century, often provoking (your choice) picturesque or grisly incidents, as my next post will show. Of course body snatching is now a thing of the past, is it not? Wrong! In 2005 an ex-dentist in Fort Lee, New Jersey, was arrested for obtaining bodies from funeral homes in New York, New Jersey, and Pennsylvania with forged consent documents, and then selling bones, organs, skin, and other body parts to legitimate medical companies and tissue banks for resale to hospitals, which needed them for transplants. They did six or seven extractions a day, a male nurse involved in the operation later confessed; it took 45 minutes for the bones, and another 15 for skin, arms, thighs, and belly. But why get involved in such a gruesome business? Because, the nurse explained, he went from earning $50,000 a year as a nurse to $185,000 as a "cutter." Yes, this illegal business is flourishing throughout our fair land, as a quick search for "body snatching" on the Internet will quickly demonstrate. I myself plan to be cremated, but this doesn't guarantee a thing; so did the people whose bodies were stolen by the dentist and his fellow ghouls. Coming soon: Profanity and me. Do we have a right to swear in public, within the hearing of little children and other delicate souls? How I cope with my own indiscretions. Interesting about Halloween, I was raised strict Protestant Evangelical in England and we were not allowed whatsoever to join in Halloween customs, in the UK Halloween was not very popular ( to do with the Protestant reformation really as Catholics were far more tolerant of Pagan traditions I find and the Puritan Protestant types got rid of any Pagan/Papist stuff ranging from May Poles to prayers for the dead, even Christmas and music in some cases, jolly people I think not. Anyway, I often wonder how North America given it is very Protestant Christian and in many places extremely Evangelical tolerates Halloween so much. I was told it was dark, evil and to do with the devil and very very wrong indeed. In the last 20 years Brits have fallen in love with North American culture and Halloween is big here, more so than Guy Fawkes night which of course Evangelicals permitted as Guy Fawkes was a nasty bad Papist and Papists were worse than heathens and not much better than Muslims!! The UK is now very irreligious unlike America where everyone seems to go to church and still prays. 257. Donald Trump ... Again!